This 23″ by 17″ sign is very vibrant with a variety of colors. The sign features a nice contrasting yellow and blue color, similar to Greenbay Packer Jerseys. The other accent colors are red and white. 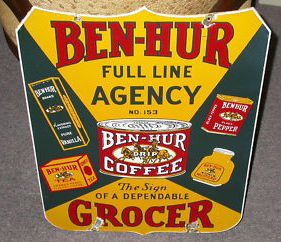 The text on the sign reads “Ben-Hur Full Line Agency, ben-Hur Coffee, The Sign of a Dependable Grocer.” To either side of the text are four different coffee products.